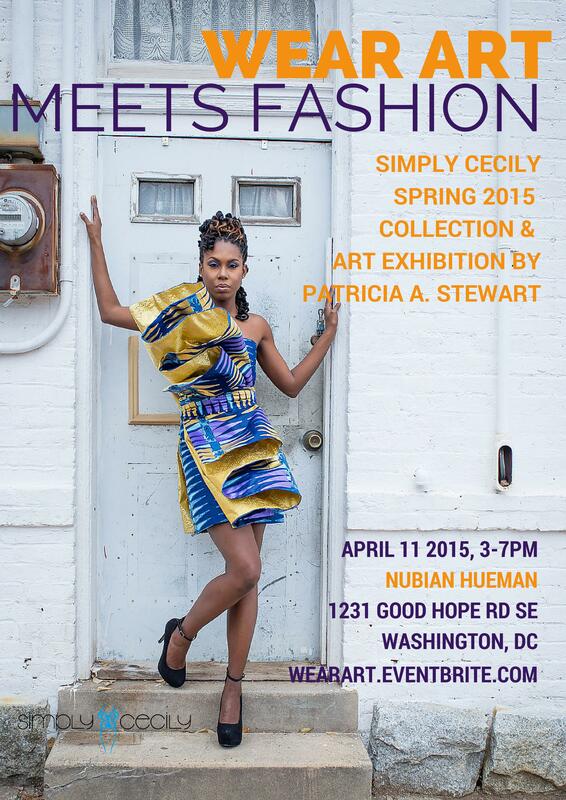 As the cherry blossoms bloom this spring, so does Simply Cecily’s Spring 2015 collection and trunk show. Fashion Designer and Simply Cecily Founder Cecily Stewart Habimana is pleased to present her couture collection called Wear Art Meets Fashion. Habimana teams up with visual artist Patricia A. Stewart to present an exhibition that stretches the boundaries of what is considered fashion and art. Imagine 3-D sculptures, paintings and jewelry created by Stewart carefully paired with couture dresses by Habimana all while fusing Simply Cecily’s signature style of “traditionally African with a modern American twist.” Simply Cecily’s spring 2015 includes everyday dresses, maxi and box pleated skirts and jumpers that are inspired by the 1950s with defined waists, vibrant colors and bold statements. The entire collection will be available for sale in sizes small through 2XL along with jewelry and art from Stewart. Meet us across river for a unique afternoon of art and fashion.